In this instructional video, Maurice covers a plethora of scales and their corresponding modes and also discusses proper playing technique in both the left and right hand. He also in this jam packed video lays out a “game plan” or set of rules and guidelines in order to improve on speed development and ease of playing and learning how to “play” the guitar and not “working” the guitar. 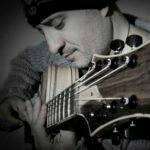 Toward the end, M Arenas also explains in detail examples of proper practice habits and regimen for a guitarist who wishes to play faster and more effortlessly in a short amount of time.